« Shale gas and tight oil from low permeability reservoirs have provided a new lease on life for U.S. oil and gas production. 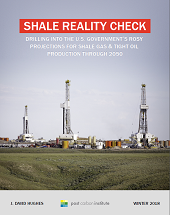 Tight oil has allowed U.S. oil production to double from its 2005 lows, and shale gas has similarly allowed a major increase in U.S. gas production. However, the nature of these reservoirs is that they decline quickly, such that production from individual wells falls 70–90% in the first three years, and field declines without new drilling typically range 20–40% per year. Continual investment in new drilling is therefore required to avoid steep production declines. Older fields like the Barnett, where drilling has nearly ceased, are in terminal decline. Shale plays also exhibit variable reservoir quality, with “sweet spots” or “core areas” containing the highest quality reservoir rock typically comprising 20% or less of overall play area. In the post-2014 era of low oil prices drilling has focused on sweet spots which provide the most economically viable wells.